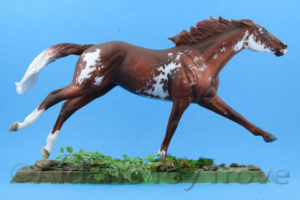 Home » Model Horse	» Custom Ruffian By Unknown Artist On eBay – Can You Help? I listed a lovely custom Ruffian to eBay. 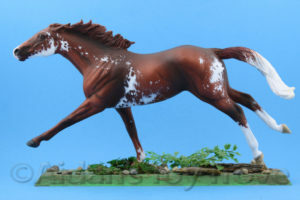 She has a bit of resculpting and is painted to a flashy chestnut sabino pinto. The auction ends at 6:14pm PST on Sunday December 4th. This horse is a bit of a mystery to me. I do not know who the artist is and I was unable to read the signature. I’m posting some photos here in the hopes that someone recognizes this piece. There are more pictures that can be enlarged in the auction. Can anyone help my identify this lovely horse’s artist? One Response to Custom Ruffian By Unknown Artist On eBay – Can You Help?